Barnsley teenager Danny Rose headed in a dramatic late equaliser to deny Ipswich their first win of the year. The 19-year-old striker had only been on the field for four minutes when he headed in Tom Kennedy's cross for the first league goal of his career. Ipswich defender Luke Chambers had given the hosts the lead early in the second half with a fierce low shot. But as Town fans prepared to celebrate a third league victory in five home games, Rose struck for Barnsley. Barnsley dominated for long periods, but squandered a hatful of chances in David Flitcroft's first game as permanent manager. Striker Marlon Harewood was guilty of missing more than a few, but he was not alone. Chris Dagnall twice went close in the early exchanges, his angled shot blocked by Ipswich defender Chambers before home goalkeeper Scott Loach parried a goalbound effort. Barnsley continued to create chances, the best of which fell again to Harewood in time added on at the end of the first half when he fired against the foot of the post. 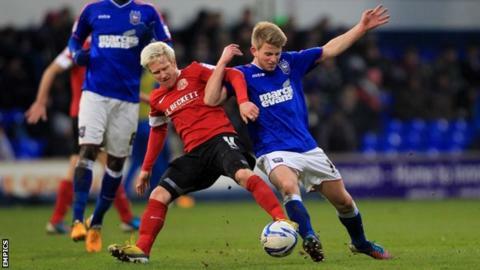 But Ipswich took the lead against the run of play 10 minutes into the second half. Defender Aaron Cresswell swung the ball into the area and when Barnsley failed to clear the danger, Chambers - who had blazed a similar chance over the crossbar in the first half - lashed the bouncing ball into the bottom corner. Chances at either end dried up as temperatures began to drop before Harewood wasted another chance when free inside the area, pulling his low shot wide. Dagnall was next to pass up the opportunity of an equaliser for the Tykes, heading Kennedy's cross wide from six yards and Harewood fired wide again after the ball had ricocheted to him inside the box. Barnsley boss David Flitcroft: "It was a hard-earned point. We can't afford to do anything other than go all-out for victories. "We've got to win games and gain momentum, by picking up three points. It would have been catastrophic if we'd come away with no points." Ipswich manager Mick McCarthy: "They were the better side and took the game to us. They didn't sit back and try and catch us on the counter. "We would have nicked it if we'd taken the three points and I'd have been delighted. "We'll take the point, put it in our pocket and keep it and make sure we keep picking up more."